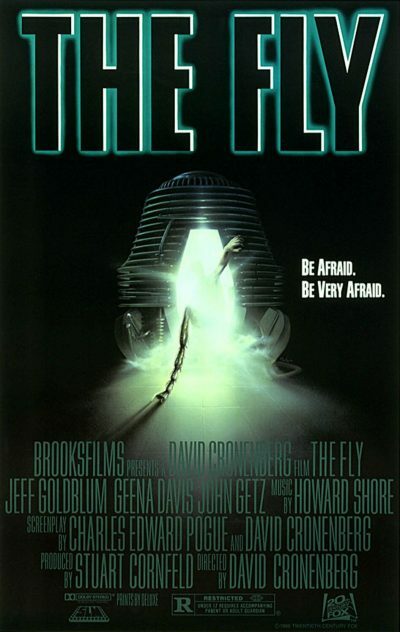 Weird to realize The Fly was almost not a Cronenberg film. While the producers wanted him to direct, he was at the time committed to a movie called Total Recall, so they were going with a little-known English director of commercials, Robert Bierman. Unfortunately, his daughter was killed in an accident during pre-production, and Bierman’s enthusiasm for feature film-making at that point evaporated. [He has made only two since: Vampire’s Kiss, the “Nicolas Cage eats a cockroach” film, and Keep the Aspidistra Flying, with Richard E. Grant and Helena Bonham-Carter] Around the same time, Cronenberg parted ways with Recall, and agreed to direct this, if he could rewrite the script. I note the actor who played Convex, also appears here, as the doctor who counsels Veronica regarding termination of her pregnancy. She fears the DNA mutation affecting Seth will affect her foetus, a worry made clear during one of the most memorable dream sequences in horror cinema. This culminates in Veronica giving birth to a giant maggot (below). At the request of the actress, Cronenberg himself cameos as the gynaecologist – perhaps foreshadowing his interest in the topic, as expressed in Dead Ringers. It’s also interesting to look at Goldblum’s portrayal of Brundle. Though eventually going down a much darker road, pre-splice Seth can be seen as a precursor of the similarly quirky scientist role, which he appeared to corner in the nineties, particularly in Independence Day and Jurassic Park. The original cut of the film was darker still, containing a sequence where Brundle attempted an experiment involving a baboon and cat. Emphasis on “attempted”, since the result reminded me of Jonathan Coulton’s song, Skullcrusher Mountain: “I made this half-pony, half-monkey monster to please you. But I get the feeling that you don’t like it – what’s with all the screaming?” He ends up clubbing it repeatedly with a pipe, before heading up to the roof for a bit of moping. Where a leg grows out of Seth’s midriff. Which he gnaws off. It was all A Bit Much, even for a Cronenberg film, and it’s hard to argue with producer Stuart Cornfield, when he said, “If you beat an animal to death, even a monkey-cat, your audience is not going to be interested in your problems anymore”. The pacing is remarkably quick, and the film crams a lot into its 95 minutes. There’s little or no warm-up before Seth is demonstrating his teleportation devices to Veronica, and things proceed rapidly on from there. Similarly, at the other end of the film, it’s almost abrupt in its termination. There were various alternative endings considered, and even shot, involving various codas. Perhaps the most intriguing was the “butterfly baby” one, where Veronica has another dream involving her carrying Brundle’s child. Except this time, it’s less nightmarish, with the creature breaking out of a cocoon within her, to become a butterfly. As with the previous paragraph, it’s hard to argue the decision to remove this was incorrect. Thirty years on, and Chris Walas’s special effects are… okay (in his defense, the schedule allowed to produce them provided only about half the time typically needed). 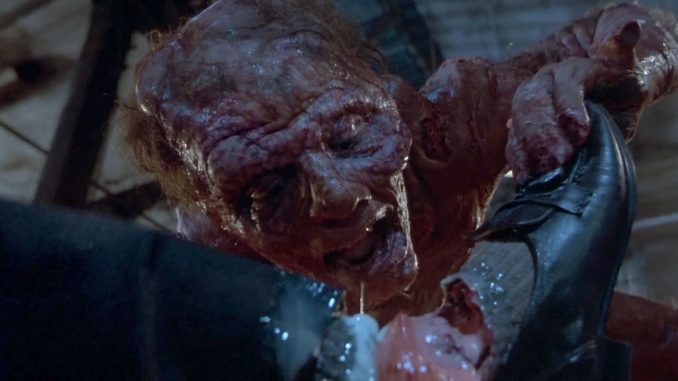 While laudably practical in nature – and thus, an improvement over the primitive CGI used in, say, Total Recall – they haven’t stood the test of time as well as Rob Bottin’s from The Thing, especially when the ones here are intended to be more directly human. For instance, you can see the latex suit Goldblum wears wrinkling, when he turns his head – and he does that a lot, because the actor is imitating the twitchy movements of the fly whose DNA Brundle shares. However, the missus is still unable to watch the sequences where Brundle-fly eats, by throwing up digestive saliva onto the intended meal. So, well done there, Mr. Walas. All told, it’s solid stuff, delivering an icky experience that (even without the baboon-cat!) still managed to get an “Ew! Gross!” or two from this highly-jaded viewer. Goldblum as a scientist may be something done to death since, and outside of the dream sequence, Davis doesn’t have much to do, beyond looking increasingly appalled. Yet it’s a rare treat to see a “fringe” film-maker like Cronenberg, brought into the mainstream system, and given the freedom to pursue a vision which is little, if any, less extreme than his independent work. And let’s just pretend the ill-conceived sequel, directed by Walas, never happened, eh?